We’re gonna be straight with you - frankly, the whole “happy hippie” commune thing scares the bejizz out of us. No one is that happy and cool and chill all the time without repressing some serious underground rage issues. Think about it! You know who the scariest teachers were back in school? Not the ones who yelled all the time - it was the ones who would just sit there and stare at you and then talk really quietly about how pissed they were about how you were acting. Those are the people who go postal. When you try to be cool all the time, sooner or later, someone’s gonna come along who harsher your chill, and you’re not letting steam out on the regular? That mountain’s gonna blow! So all we’re saying is…hey. We get that you wanna, like, be all about peace and love and giving the power back to the people, but you also gotta be you, bro. You gotta express those feelings and air out those hang-ups, or you’re still just gonna be a straight-up stiff in hipper clothes, dig? 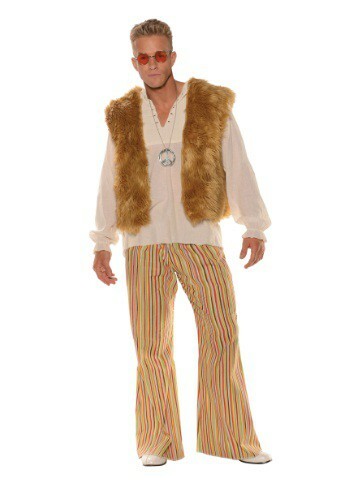 And yeah, this Men's Sunny Hippie Costume makes you look super cool, but to be that cool on the inside, you gotta find a healthy, natural outlet for all those man-made feelings. Maybe, y'know, chop some wood for your commune, or take up surfing while you’re living in your van by the beach, or even get someone to show you how to weave those cool hemp wall-hangings we keep seeing around. We hear that stuff is really therapeutic! Anyway, we gotta get back that old man's desert ranch we just moved into! Peace, man. PEACE.